The industrial laser market is seeing unparalleled growth, and much of this is being attributed to the reduction in cost of laser diodes, and the new “direct diode approach” to building laser modules and systems. Due to this vastly expanding technology, their is a growing demand across a wide variety of industries, for products and systems that utilize laser technology. As a result of this industry growth the LASORB product line is growing in popularity as well, with more and more prestigious companies using LASORB to protect the laser diodes in the products they manufacture. 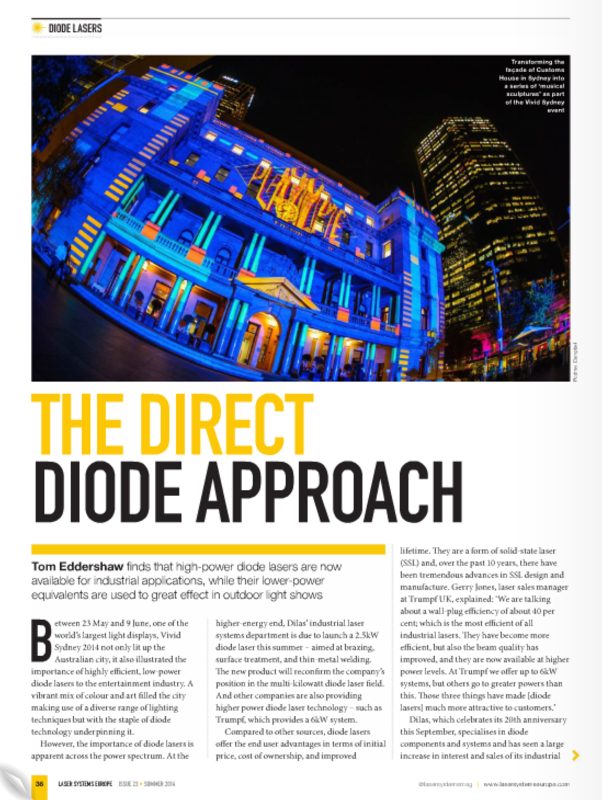 LASORB is such a game changer for laser diodes, that is has drawn the attention of Laser Systems Europe Magazine (one of the laser industries leading publications). 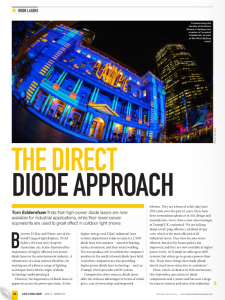 In the latest edition of Laser Systems Europe Magazine, they discuss the vastly expanding laser diode market, and interview LASORB Chief Operating Officer Justin Perry, to gain insight into why the laser diode market is growing, why the “direct diode approach” is better, and how LASORB is helping to contribute to the growth of the laser diode market overall. This entry was posted in News and tagged direct diode, laser diode systems, laser diodes, LASORB on 06/20/2014 by Justin Perry. Why we destroyed hundreds of laser diodes -- so you don't have to!